If we can eek out some accumulation here it would give us at least one winter event in each wintry month: Dec. Jan. Feb (Super Bowl Ice) and March. That's not a bad winter and makes up for an overall lousy February. Yeah, *IF* we got a system like that, I think you could cut those clown map totals down to 25%.. 1/2" realistically would accumulate on grassy surfaces in Wake.. Air temp, soil temps... Mike Moss on WRAL was mentioning it yesterday, which is very early for WRAL, but even he said that soil temps were a big issue. 6z GEFS much improved compared to the 0z GEFS. 6z GFS was a paste event for the foothills. It probably wouldnt be any better than 6:1 but MRN had 1.1" of snow QPF. GEFS trend loop. Davis Strait positive anomaly & Newfoundland low haven't really changed. Gulf of Alaska low & western ridging have trended west. TN Valley trough is more separated and farther south. Best case scenario is for that backside wave to close off strong and sink farther south into Dixie in the Mar '09 mold. GSP saying they have to watch the models very closely, just a slight shift of the low to the south could cause impressive snow amounts lower than the highest peaks. Come on Mr. Low pressure, please go south of us a little more. 12z ICON amps up the low right off the NC/VA shore similar to the 6z run. Looks like the wave digs a tad father south this run. If we can get that surface low to track along the FL Panhandle and a slightly quicker phase, many on this board would be in business. I don't think that it is out of the question, but what it all boils down to right now is that we are tracking a phasing system that will likely bomb out. 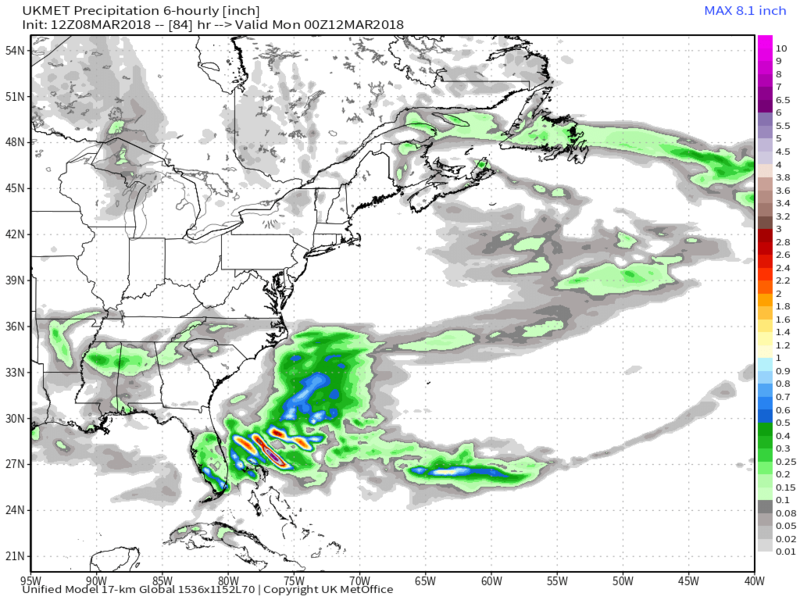 I wouldn't expect any model to have this system nailed down at this point in time. 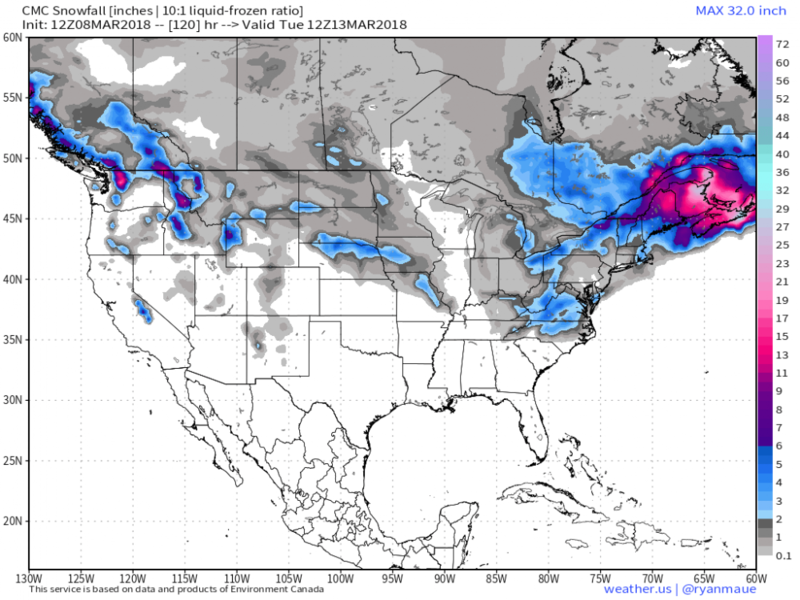 Lets see what the 12z GFS and CMC throw out. Yeah, it's not a good track for RDU and points SE. Starts out good over extreme southern Alabama but then makes a beeline for Wilmington. Needs to track about 75 - 100 miles further SE. Not much cold or dry air to work with either. 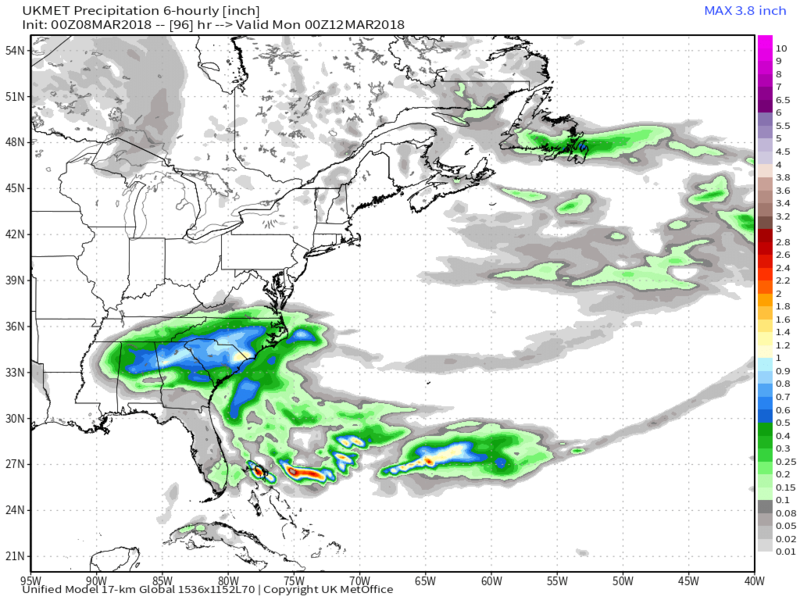 Edit: I smell a 35 degree driving cold rain with this one outside of the mountains and Northern NC into VA.
12Z GFS looks like a cold rain for most east of the mountains. Might want to look again. I keep hammering this home but the evolution of this event reminds me a great deal of 3/1/09. Being 2 weeks later is not going to help us. Cold air marginal. It snowed two inches here last year around almost that same exact date. Hope so. That was the last time I've experienced Thundersnow. That being said, the ULL seems to open up on most of the models as it heads southeastward. Ukie is further south at 72,1009 low in the Fla panhandle. This reminds me of March last year. Models showed a DC storm and it kept coming further and further south. Ended up with close to 3 inches south of charlotte. Might have even been the same day. It was around March 10. Using the french UKMET maps, I dont think it's going to be cold enough but i'll reserve judgement. It can certainly happen. Would like to see model consensus before I am in on this one.